News | Moviemem Original Movie Posters - James Bond Spy Who Loved Me Daybill Original or Reissue? There are two versions of The Spy Who Loved Me Daybill movie poster but there has always been some confusion about which came first. One is printed by M.A.P.S and the other by Robert Burton. Both are full colour, although the Burton daybill has an extra yellow colour in the title and in other areas on the poster. The M.A.P.S daybill measures 13" x 30". The Burton measures 13" x 28". 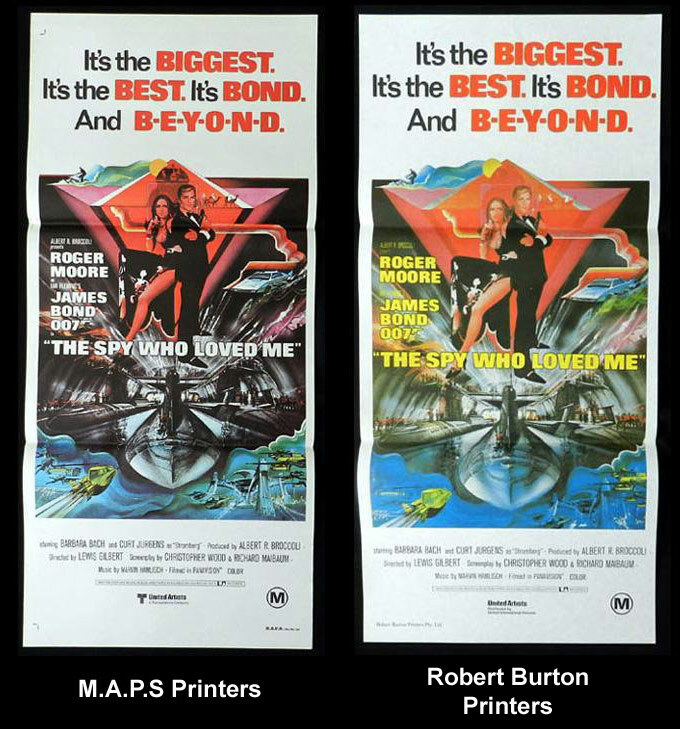 Robert Burton were printing movie posters well before M.A.P.S so it is understandable that collectors and dealers have wondered which one was the true first release. The Burton daybill is certainly the more impressive of the two with sharper colours and printing. Both feature Bob Peak artwork. Incidentally, I have always thought that the art on Spy Who Loved Me posters was not Bob Peak's best work. The image of Roger Moore is a bit insipid to me, not only on the daybills but also on American posters which feature the same art. However, the evidence points to the M.A.P.S Spy Who Loved Me daybill as the true first release while the Robert Burton daybill appears to have been printed a little later - possibly 1981. The Spy Who Loved Me was released in Australia in Dec 1977. The M.A.P.S daybill carries the United Artists logo and notation "A Transamerica Company". The Burton daybill carries the United Artists logo but underneath that is the notation "Distributed by United Pictures International". In 1981, MGM merged with United Artists. They still had their own international distribution arm. The new company was reorganised to become United Pictures International. This indicates that the Robert Burton printed Spy Who Loved Me daybill must have been printed around or soon after 1981 to coincide with the change of distribution details. There is no record that I can find of an official re release of the film in Australia so I don't think it is possible to be exact in dating the Burton daybill. The M.A.P.S Spy Who Loved Me Daybill is clearly the original 1977 first release while I feel that the Robert Burton Daybill should probably be referred to an early 1980s printing/release to conicide with the change of distribution of the film.